Karen Franklin and Frazer Bond have combined forces to organise the Charity Golf Classic at Gulf Harbour. A charity event at the Gulf Harbour Country Club on March 15 is set to give 10 teenagers a once-in-a-lifetime opportunity on the Spirit of New Zealand. The charity classic is being jointly organised by Harcourts real estate agent Karen Franklin and the country club. Ms Franklin, who is herself a keen golfer, has been sponsoring young people on the Spirit since 2014. To do this, the event will need to attract around 110 golfers and raise $25,000. The event will be an Ambrose tournament for teams of four. Golfers who sign up on their own will be allocated a team. The cost per golfer is $150, which includes a cart, buffet dinner and prizes. 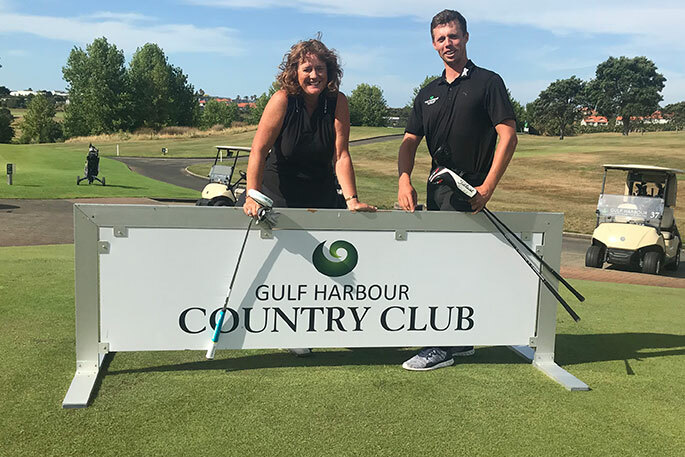 Country club director of golf and NZPGA member Frazer Bond says a charity event normally appeals to a wider range of golfers and is always a lot of fun. MC at the dinner will be sports reporter Jim Kayes. Every year, 1200 young New Zealanders take part in a Spirit of New Zealand voyage where the key themes are excellence, integrity, impact, environmental sustainability, innovation, diversity, community and participation, and equity. Info about the golf classic: Phone Karen on 021 779 838 or Frazer on 021 112 6031.